A cruel April Fools Day joke this is not, unfortunately. 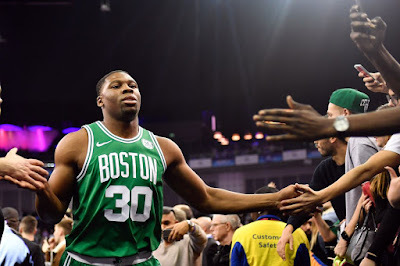 In an ongoing disaster of multiple, potentially season-ending injuries plaguing the Boston Celtics this season, the team now relates the Guerschon Yabusele may also be in danger for the playoffs with knee discomfort severe enough to have it looked at with an MRI. It's difficult to say just how worried we should be with such limited information, but the whole lot of "Danny Ainge made a deal with the devil" narratives are certainly becoming increasingly plausible. We'll have further information on Yabu's knee and what, if anything, Boston plans to do about it when it comes available. #NEBHInjuryReport: Guerschon Yabusele experienced some knee pain after last night’s game and is having an MRI today.